Learn how millionaires think, and model their success - so you don't have to reinvent the wheel. 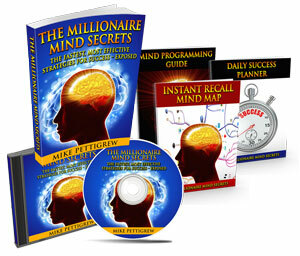 Discover the most effective millionaire mind programming techniques, so you get whatever you want more easily. Discover a goal achievement formula so powerful you can achieve anything 10 times faster. Mike teaches how our thoughts and actions influence our journey and determine whether we’ll succeed or not. He also provides specific exercises to carry out. I am an entrepreneur with ambitious goals. Ambitious goals are not straight forward to achieve, so I continuously look for experiences, ideas and inspiration from other entrepreneurs. Mike’s program is a great source of inspiration. It has helped me to be more empowered to achieve my goals. Many thanks to you Mike for creating this program. This success manual has given me so many great ideas for ways I can get passionate about my professional and personal life again, that I know I will be returning to it again and again. It has endless wisdom about how to get from where you currently are in your life, to where you want to be! I highly recommend “The Millionaire Mind Secrets” for anyone who wants to better their life and situation. A great treasure! This product is created and sold by Mike Pettigrew, the product's vendor.